Peppers look yummy and healthy. Adding sprouts is new to me. they look delicious..thanks for sending these peppers to the event! They look delicious....and the addition of sprouts makes them healthy too. 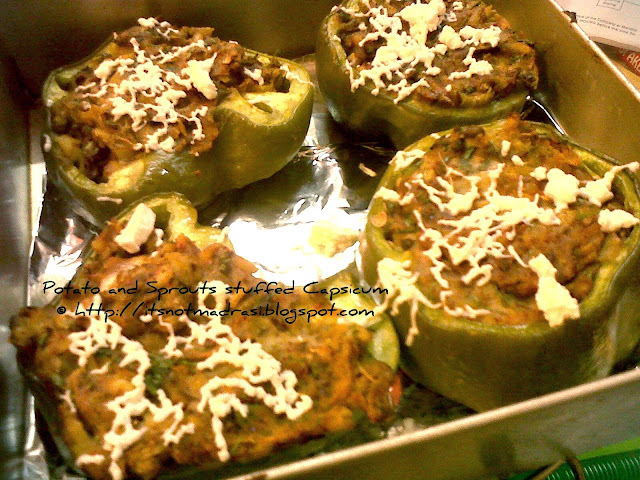 I always wanted to make these stuffed ones, I remember how delicious these look on some of the pressure cooker recipe books..:)..never came around because I don't like eating pepper like that..still your plate looks very inviting! It is my all time favorite. Your's looking yummy. Thanks for linking to LGSS_Potato. chk out my space for this Months Event on Berries - hope to see some recipes form you ....and a chance to guest host too!